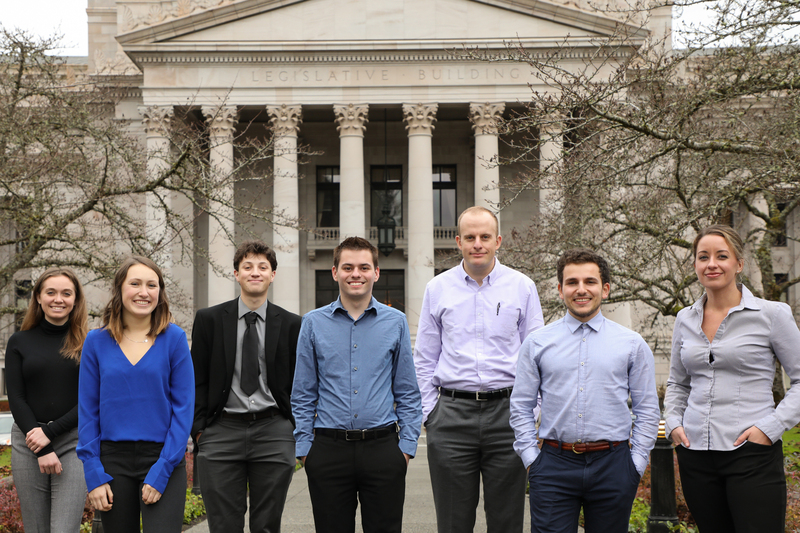 The UW Department of Communication is pleased to welcome seven student journalists to the 2019 cohort of the Olympia Legislative Reporting Program. The program is designed to immerse students in paid, full-time reporting jobs each winter quarter with news outlets covering the Washington State Legislature. The students selected for this opportunity are some of the brightest and most civically-minded the Department has to offer, said program coordinator Meg Spratt. Devon McBride is currently pursuing a double-major in Communication and Political Science, in addition to serving as The Daily’s news editor. As evidenced by his studies, he’s keen to work in Olympia and further explore the intersection between politics and the media. Originally from Olympia, McBride says he’s looking forward to revisiting the city as a journalist, and getting to do some more in-depth, “real reporting” in a high-stakes, fast-based media landscape. Max Wasserman participated in the program last year, and describes his initial experience as “a professional wake-up call.” This year, he welcomes the opportunity to do more radio stories and feature writing. He’d like to report on the criminal justice system, as well as hone his newly acquired data journalism skills. “My second year with the program is an opportunity to go somewhere new; moving from the edge of what’s going on into the very center of things,” he explains. Jake Goldstein-Street is another UW Communication student who works for The Daily. He is currently double-majoring in Journalism and Political Science. A former-resident of Shoreline, Goldstein-Street is looking forward to travelling to Olympia, and the challenge of writing stories on more complex issues than those he covers for the UW school newspaper. In particular, he wants to better understand the language of proposed bills, as he hopes to be a political journalist after earning his degree from the Department. Shauna Sowersby joined the UW Department of Communication after serving with the Navy at Bremerton and elsewhere. During a six-month-long program, she trained in public affairs reporting and photojournalism. However, Sowersby can trace her passion for communications back to her childhood, when she made her own newspaper and published reviews of the popular boy-bands of the time (this just in: The Backstreet Boys were better than NSYNC). She says she’s eager to gain more “hands-on” reporting experience while in Olympia, and is interested in the nuances of political journalism. Sowersby also says the program will be an opportunity to transfer her previously-acquired skillset to a new arena. Madeline (Maddie) Coats admits to having some initial reservations about applying to the program, but ultimately decided that it was “an opportunity too good to pass up.” Coats wants to come out of the program with a robust portfolio of published work, and a better understanding of legislative processes. She hopes to have a future career in breaking news, which she knows will benefit from her working in Olympia’s “fast-paced reporting” environment. In particular, she wants to learn more about legislation focused on the environment and the mental health crisis, which not only affects Washington state, but people across the nation. Sean Harding looks forward to “rubbing shoulders (and perhaps bumping heads)” with those who shape Washington state law. A veteran interested in pursuing a graduate or law degree after he earns his B.A., Harding says he views the program as another way in which he can serve his country. Currently, he is the President of the UW chapter of the Society for Professional Journalists (SPJ). Harding says he’s excited to gain more “real world experience” while in Olympia, as well as a greater understanding of how American democracy works. Emma Scher is pursuing a double-major in Communication and Sociology, which she says has resulted in a more critical eye for politics and the legislative process. She says that her research-based, statistic-heavy studies have given her a better sense of how political decisions tangibly affect constituents. She’s eager to immerse herself in the experience, and be able to focus on reporting. She is also grateful for this singular opportunity to build a stronger profile of work. Communication students, faculty, alumni and other friends of the Department are encouraged to follow the students’ progress via the UW Olympia Reporters Facebook page, which will feature articles published by each student throughout their time in Olympia.